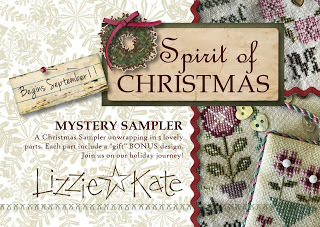 The long awaited Lizzie Kate Christmas Mystery Sampler is really coming soon. Here are the details we have just received from Linda and Alan. Design will be revealed in 3 monthly parts. Mystery will ship on September 1, October 2, and November 1. 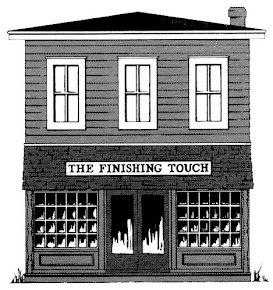 Each part will contain a coordinating BONUS project…that’s 3 “gift” designs. Linda stitched “Spirit of Christmas” on 32 count Heartland linen from Picture This Plus. They worked with the ladies of PTP to craft a lovely NEW neutral fabric for their mystery. We will be offering pre-cut fabric in 4 choices---28 and 32 ct. Heartland linen, and 14 and 16 ct. Heartland Aida. Everyone is invited to this mystery, whichever fabric you prefer. As always, the PTP precuts will be serged, individually packaged. Stitch Count for “Spirit of Christmas” is 95W x 191H. Not coincidentally, the colors are compatible with Lizzie’s Holly and Hearts Mystery Sampler, for those addicted mystery stitchers. Bonus projects are: Holiday Home 2 sided scissor fob, Christmas Love pin pillow and Christmas Is…mini sampler. Thread pack will be available, including a new color from Weeks Dye Works. Linda is working with Miranda and her whiz color team to create a new color especially for Spirit of Christmas. Thread pack includes 11 skeins of Weeks Dye Works, including the new “mystery” color. You will not be able to order the “mystery color” separately. We will have a lovely embellishment pack that includes goodies for “Spirit of Christmas” and all 3 bonus projects. One more thing, we’ll have a Christmas Needle Nanny. The gals at Zappy Dots are making a beautiful collectible “dot” just for this mystery. Perfect place to park your needle while watching the mystery unfold. Now that you have all the details, to be ready to place our order, we need to know what you would like. Let us know if you have any questions or what we can do to help.